What are some common things you like to do with your data? Maybe remove rows or columns, do calculations and maybe add new columns? This is called data wrangling. It’s not data management or data manipulation: you keep the raw data raw and do these things programatically in R with the tidyverse. We are going to introduce you to data wrangling in R first with the tidyverse. The tidyverse is a new suite of packages that match a philosophy of data science developed by Hadley Wickham and the RStudio team. I find it to be a more straight-forward way to learn R. We will also show you by comparison what code will look like in “Base R”, which means, in R without any additional packages (like the “tidyverse” package) installed. I like David Robinson’s blog post on the topic of teaching the tidyverse first. For some things, base-R is more straight forward, and we’ll show you that too. Whenever we use a function that is from the tidyverse, we will prefix it so you’ll know for sure. Let’s start off discussing Tidy Data. 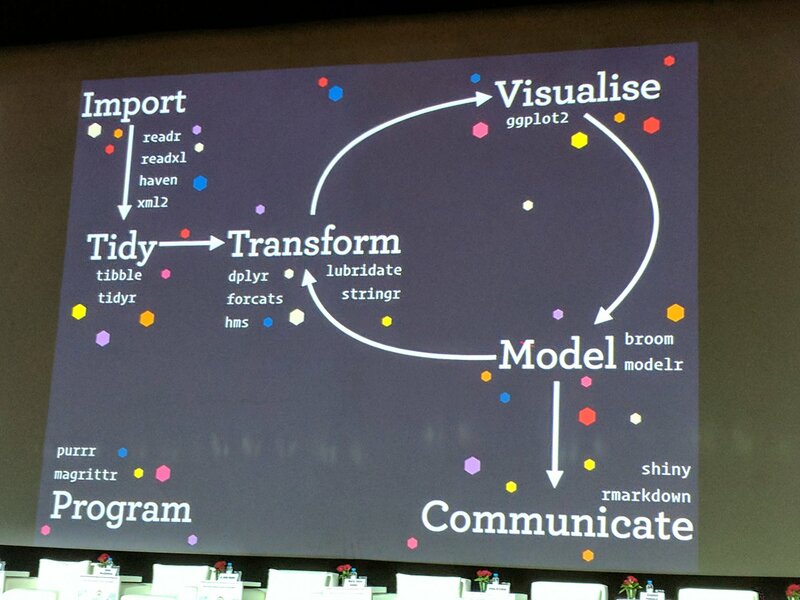 Hadley Wickham, RStudio’s Chief Scientist, and his team have been building R packages for data wrangling and visualization based on the idea of tidy data. Tidy data has a simple convention: put variables in the columns and observations in the rows. The national parks dataset we were working with this morning was an example of tidy data. When data are tidy, you are set up to work with it for your analyses, plots, etc. Conceptually, making data tidy first is really critical. Instead of building your analyses around whatever (likely weird) format your data are in, take deliberate steps to make your data tidy. When your data are tidy, you can use a growing assortment of powerful analytical and visualization tools instead of inventing home-grown ways to accommodate your data. This will save you time since you aren’t reinventing the wheel, and will make your work more clear and understandable to your collaborators (most importantly, Future You). We’ll do this in a new RMarkdown file. Delete the irrelevant text and write a little note to yourself about how we’ll be wrangling gapminder data using dplyr. You can edit the title too if you need to. This is becoming standard practice for how to load a library in a file, and if you get an error that the library doesn’t exist, you can install the package easily by running the code within the comment (highlight install.packages("tidyverse") and run it). Yesterday we explored the national parks data.frame visually. Today, we’ll explore a dataset by the numbers. We will work with some of the data from the Gapminder project. This is data-view mode: so we can have a quick look at the data. It’s a .csv file, which you’ve probably encountered before, but GitHub has formatted it nicely so it’s easy to look at. 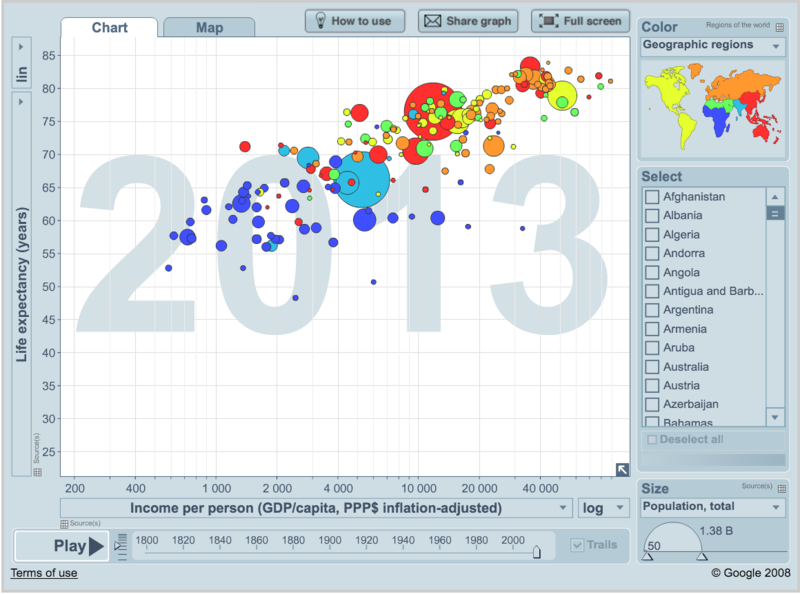 You can see that for every country and year, there are several columns with data in them. We can read this data into R directly from GitHub, without downloading it. But we can’t read this data in view-mode. We have to click on the Raw button on the top-right of the data. This displays it as the raw csv file, without formatting. Now, let’s go back to RStudio. In our R Markdown, let’s read this csv file and name the variable “gapminder”. We will use the read_csv() function from the readr package (part of the tidyverse, so it’s already installed!). Note: read_csv works with local filepaths as well, you could use one from your computer. tail(gapminder, 12) # guess what this does! str() will provide a sensible description of almost anything: when in doubt, inspect using str() on some of the recently created objects to get some ideas about what to do next. gapminder is a data.frame. We aren’t going to get into the other types of data receptacles today (‘arrays’, ‘matrices’), because working with data.frames is what you should primarily use. Why? More ways to learn basic info on a data.frame. We can combine using c() to reverse-engineer dim()! It’s a side-note here, but I wanted to introduce you to c(): we’ll use it later. c(nrow(gapminder), ncol(gapminder)) # ?c combines values into a vector or list. To specify a single variable from a data.frame, use the dollar sign $. The $ operator is a way to extract of replace parts of an object — check out the help menu for $. It’s a common operator you’ll see in R.
OK, so let’s start wrangling with dplyr. You will want to isolate bits of your data; maybe you want to only look at a single country or a few years. R calls this subsetting. filter() is a function in dplyr that takes logical expressions and returns the rows for which all are TRUE. Remember your logical expressions from this morning? We’ll use < and == here. You can say this out loud: “Filter the gapminder data for life expectancy less than 29”. Notice that when we do this, all the columns are returned, but only the rows that have the life expectancy less than 29. We’ve subsetted by row. Let’s try another: “Filter the gapminder data for the country Mexico”. What is the mean life expectancy of Sweden? Hint: do this in 2 steps by assigning a variable and then using the mean() function. Then, sync to Github.com (pull, stage, commit, push).